This Public Speaking Training is delivered in-house at your venue and is tailored to suit your requirments. Whether you are a beginner and want to learn Public Speaking Skills or a seasoned pro who wants to improve your Public Speaking, this session is ideal for you. 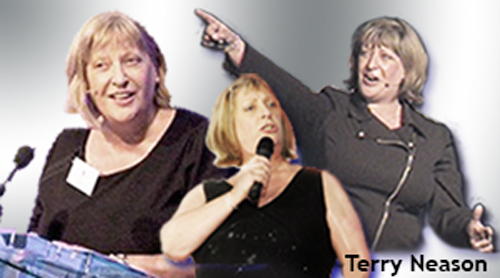 Walk your talk with award winning Performer & Motivational Speaker, Terry Neason. If you want to be a confident and effective public speaker, attend this Course and you will learn the best techniques, stage craft and speaking skills from a true professional. Thank you for considering the Public Speaking Course. On this session I will be sharing my favourite best practice techniques; plus guidance on different communication styles and impact of language. I'm sure you will agree that confident speaking skills, use of effective language and rapport skills are very handy tools to have in life. Tools that will enable you to make a positive impact, whether making a Speech, addressing a Meeting or delivering a Presentation. "The advice on language, posture, dress, slides, breathing and delivering with emotion and conviction was spot on. As they say you've had the rest now get the best."